American Ninja is not a ‘good’ film in the traditional sense yet god help me, I liked it for just how 1980s it feels and looks. The acting isn’t great and the scriptwriting was horrible, yet Michael Dudikoff and Steve James managed to save it from itself and made a really fun bad movie. 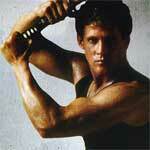 Plot Synopsis: Joe Armstrong (MICHAEL DUDIKOFF) is a one-man ninjitsu fighting machine. Serving in the army to avoid a prison sentence, Joe will find himself battling the deadly ninjas of the Black Star Order, as well as corrupt military leaders in order to bring down an illegal arms sales conspiracy. Joining in on the adventure is Joe’s comrade-in-arms Curtis Jackson (STEVE JAMES) and Patricia Hickock (JUDIE ARONSON), the daughter of Joe’s commanding officer Colonel William Hickock (GUICH KOOCK). Quick Hit Review: Ah, combine the 1980s with The Cannon Group and it’s usually a recipe for awesome cheesy action-schlock. 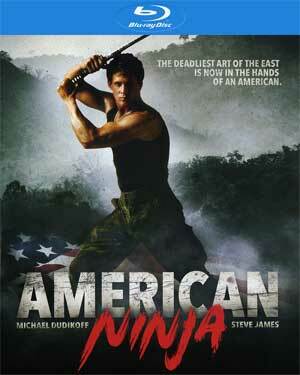 American Ninja is a classic, amongst the Cannon library anyway, that is too funny not to enjoy. The acting is bad, the fight chorography terrible and the writing somehow is the worst of the bunch. Yet, it’s hard not to have a good time and at least the two leads possess some charisma. 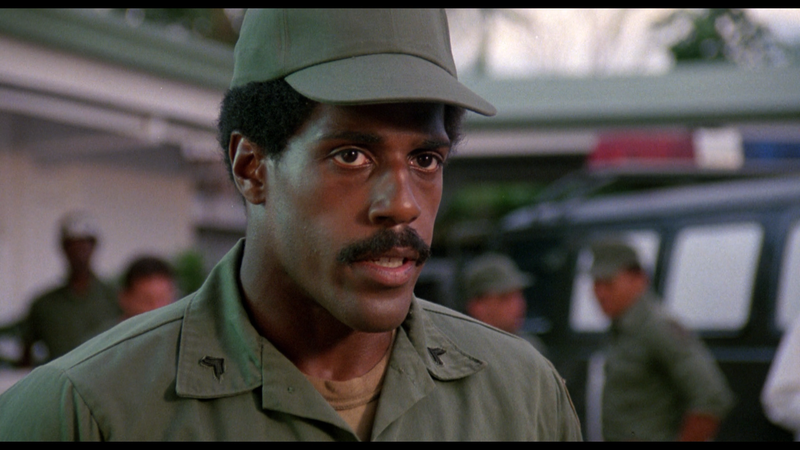 Audio Commentary – Director Sam Firstenberg and Elijah Drenner, producer of A Rumble in the Jungle: The Making of American Ninja. It’s a basic track but both participants provide background on the project with the director recounting his days working on the project while Drenner serves as a moderator asking the questions. 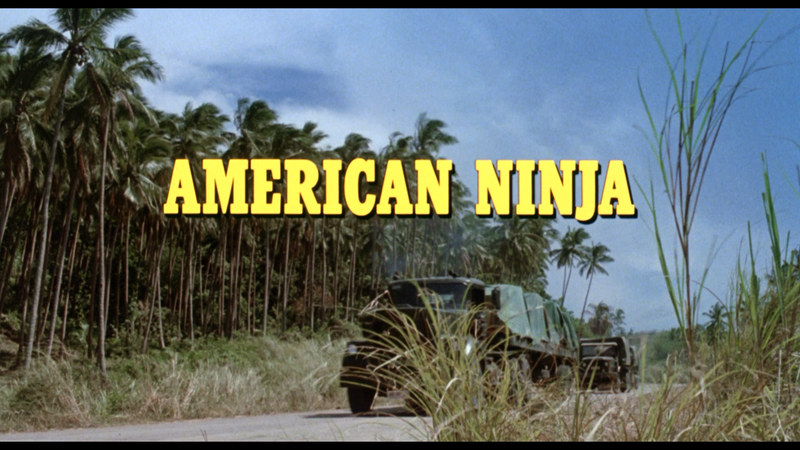 A Rumble in the Jungle: The Making of American Ninja (22:48; HD) is a featurette with new interviews with director Sam Firstenberg, actors Michael Dudikoff and Judie Aronson (who has aged well I might add), screenwriter Paul De Mielche and stunt coordinator Steve Lambert. 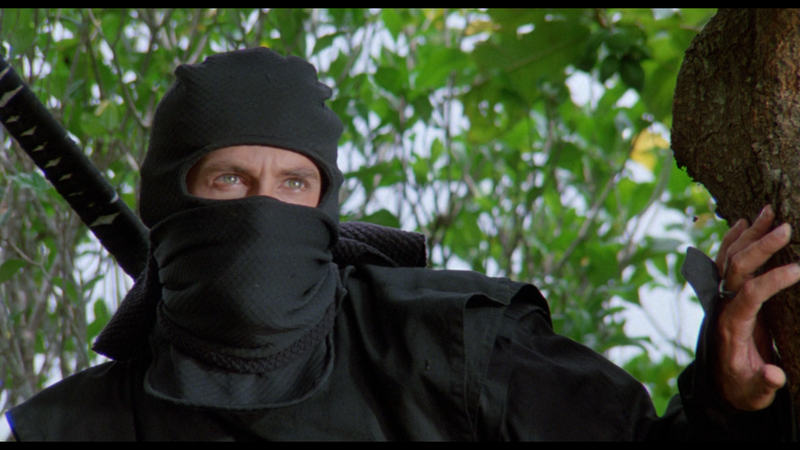 Olive Films brings American Ninja onto Blu-ray presented in its original 1.85 widescreen aspect ratio and for the most part, it’s a nice looking 1080p high-definition transfer; colors look nice and bright throughout and although there’s the occasional dust mark or scratch, it’s fairly clean. The picture is well defined with sharp detail especially on the close-ups though distant shots begin to lose some texture. All in all, it’s a well done transfer. The DTS-HD Master Audio Mono track sounds pretty darn good. Although the depth isn’t the best, dialogue levels at least were crisp and clear and any of the numerous action sequences made fine usage of the singular channel. As with the picture, it might not be worthy of a wow or anything, it is certainly a nice step up from previous releases. Overall, American Ninja is not a ‘good’ film in the traditional sense yet god help me, I liked it for just how 1980s it feels and looks. The acting isn’t great and the scriptwriting was horrible, yet Michael Dudikoff and Steve James managed to save it from itself and made a really fun bad movie. The Blu-ray released through Olive Films has good video/audio transfers and a fine selection of special features.